Blackberry & Rosemary Pork Tenderloin – Pork tenderloin is marinated in a blackberry & rosemary marinade, grilled to perfection, and then drizzled with a thick blackberry & rosemary sauce for a little added flavor. It’s a great meal to spice up the weeknight dinners or enjoy for date night in. It’s been 10 days, yet I am STILL shocked that July has arrived. How can that POSSIBLY be?! We’ve been so busy almost every weekend this summer that these new months keep catching up to me. Slow down, time! Thought these days are flying by, that does NOT mean that I am taking them for granted. No, sir! We’ve been at the pool a lot and grilling up a storm. The grill hasn’t seen as much action as its been getting these past few months. Some of my favorite new grilling recipes have been this hearty salad with charred corn and these sticky wings. But in between those meals, we are also grilling out during the week to enjoy our favorite weeknight meal: grilled pork tenderloin. It’s been a staple in our house ever since we bought our grill and we easily have it at least once a week. It’s (1) incredibly simple to make, especially at the last second and (2) it packs a punch of flavor that the typical chicken dinner just doesn’t have. We typically make our tenderloin very simply: just oil, salt, and pepper so it’s not an exciting recipe to share with your guys. But I have been dreaming up some ways I can incorporate the flavors of summer into our pork tenderloin routine that also pairs perfectly with our favorite wine, for nights when we’re entertaining or just feeling fancy. But before we get to the recipe, lets talk a little more about the wine. Do you guys remember when I raved about Clos du Bois wines back in November? I used their Cabernet Sauvignon in this rich dish of drunken spaghetti & meatballs and then paired it to drink alongside the dish. I loved how smooth and balanced the flavor was but with a price that was super wallet-friendly. Welp, nothing has changed folks – its summertime and I still love this wine! Okay maybe one thing’s changed…Clos du Bois has updated their look to be super sleek and elegant. I am loving those new labels! But don’t worry – that smooth flavor hasn’t changed one bit. In the last pairing post, I focused on pairing with a white wine. But for this recipe, you’lle get a double-dose of wine pairings! Pork is the kind of meat that tastes great with Clos du Bois Cabernet Sauvignon or Clos du Bois Chardonnay so there’s no need to choose – you can get both! In fact, I am glad that I did get both because my husband ended up loving the pairing with the Clos du Bois Chardonnay, whereas I liked the pairing with my go-to Clos du Bois Cabernet Sauvignon. Alright, alright. Without further ado, let’s get to the recipe! Say hello to your new favorite way to cook pork: Blackberry & Rosemary Pork Tenderloin! Are you guys surprised that this recipe has, of all things, berries?! Nope, me either. Ever since the berries became ripe in the spring, I’ve been OBSESSED with berry recipes. Whether is was these doughnuts or these mimosas, I was eager to incorporate berries into everything I made. And this pork tenderloin is no exception. With my obsession for berries and my obsession with grilling satisfied in one recipe, how could you go wrong?! The rich flavor of the berries and the earthy-ness of the rosemary made this pork a shoe-in for a perfect pairing with the Clos du Bois Cabernet Sauvignon. But I was surprised to find that the pork also tasted incredible with the Clos du Bois Chardonnay. See, they both have earthy/oaky undertones which pair perfectly with the rosemary and char flavors of the grill. I think the blackberries give Clos du Bois Cabernet Sauvignon the edge, but you really can’t go wrong with either one. If you’re like us, my husband hops on the grill to watch the pork, while I handle the sauce-making inside. Tag-teaming is the way to go, if you can help it. I don’t find it particularly exciting to run back and forth from the kitchen to the grill. But you do what’s best for you! Lucky for you, my husband has allowed me to share his fool-proof method for ensuring the pork is cooked perfectly, without drying out. Trust me, it’s going to be your new favorite trick. Hint, it’s called the “7-6-5 method”. Check the recipe for more details! Make sure to give yourself enough time for marinating. I only like my pork slightly tender (I prefer a steak-like texture rather than a super soft, tender one) so I only marinate for 1 hour. But if you want that soft, tender texture, prep it the morning before grilling, or the night before. Speaking of the marinade, you’ve got to let it cool before adding to the pork. Otherwise, the hot marinade will cook the pork! After cooking, let your pork tenderloin rest for 5-10 minutes to let the juices redistribute inside the pork before slicing. Otherwise, those juice will go everywhere when slicing since they’re at the surface of the pork. Do not skip out on that sauce! There is tons of flavor in the marinade, but it gets enhanced by the sauce so I highly recommend you make it. No, I INSIST you make it. You’ll regret it if you don’t. Alright, guys, there you have it! The perfect pairing for the Clos du Bois Chardonnay and Clos du Bois Cabernet Sauvignon wines. Serve up this dish to your friends and family this summer – you’ll sure to impress the whole group! What other dishes do you like to pair with these wines? Let me know what ideas you have! Pork tenderloin is marinated in a blackberry & rosemary marinade, grilled to perfection, and then drizzled with a thick blackberry & rosemary sauce for a little added flavor. It's a great meal to spice up the weeknight dinners or enjoy for date night in. In a small sauce pan, add 1 cup of blackberries, rosemary, vinegar, water, salt, and pepper. Turn heat to medium-high. Once the mixture begins to boil, turn heat off and let the mixture cool. If blackberries are still whole, give them a little mash with a fork. Reserve 1/4 cup of the mixture and set aside for later. While the mixture is room temperature but no longer boiling hot, begin to prepare the tenderloin. Place tenderloin in a gallon-sized plastic bag. Add marinade to the bag with the pork and massage into the pork until pork is covered in marinade. Place in fridge to marinate for at least 1 hour. I don't like my pork too soft and tender once it's cooked so 1 hour is my maximum (it's the texture of steak at this point). But if you like it super tender, marinate for 4-8 hours or even overnight. When ready to cook, preheat grill on high heat. Remove tenderloin from marinade and discard marinade. Place tenderloin on preheated grill over open flame. Grill for 7 minutes on one side. Flip to other side for 6 minutes. Then turn grill off, but keep lid closed shut. Let pork sit for 5 minutes. Remove from grill onto cutting board. Let pork sit for 5-10 minutes to rest. In the meantime, prepare the sauce. Place 1/4 cup of reserved marinade from Step 1 into small sauce pan. Heat to medium heat until it's boiling. Add garlic and continue to cook until it's reduced by half. Mix water and cornstarch together to make a slurry. Add to mixture and whisk together. Add blackberry preserves and whisk to thin it out. Keep stirring and cooking for 1-2 minutes, until it is thickened. Remove from heat and add last 1/4 cup of blackberries. Slice pork into 8-12 slices. Place a little sauce on plate and then serve each person 2-3 slices of pork. Garnish with a little extra rosemary and blackberries, if desired. Serve with your favorite Clos du Bois wine. My husband loves the Clos du Bois Chardonnay but I like the pairing with the Clos du Bois Cabernet Sauvignon. Can I use oven or slow cooker for this recipe? You can use an oven. First, sear the outside of the tenderloin on medium-high on a oven-safe skillet, 2 mins per side. Then place skillet with pork tenderloin in 400-degree oven to finish cooking for 10-12 mins. Hope that helps! Thanks so much! My genius husband is to thank for that grilling tip so I’ll pass along the thanks! I’ve never tried this flavour combination before but it looks and sounds amazing! Will definitely add this to our recipe list. I hope you enjoy it! Let me know how it turns out! It looks delicious, Michelin Star level! It looks amazing, I wish I could taste it! I might try even if I´m not very good at cooking! Hmmm this Looks so tasty. I never tried a fruity glaze for pork,but I definetly have to, this Looks sooooo good. Talk about yum! This post makes me hungry. It will be my husband and I’s 17th Wedding Anniversary this month and this would make the perfect dinner choice! Congratulations! This is a great option for an anniversary dinner! I’ve never had pork tenderloin but this looks amazing and I love that winery! 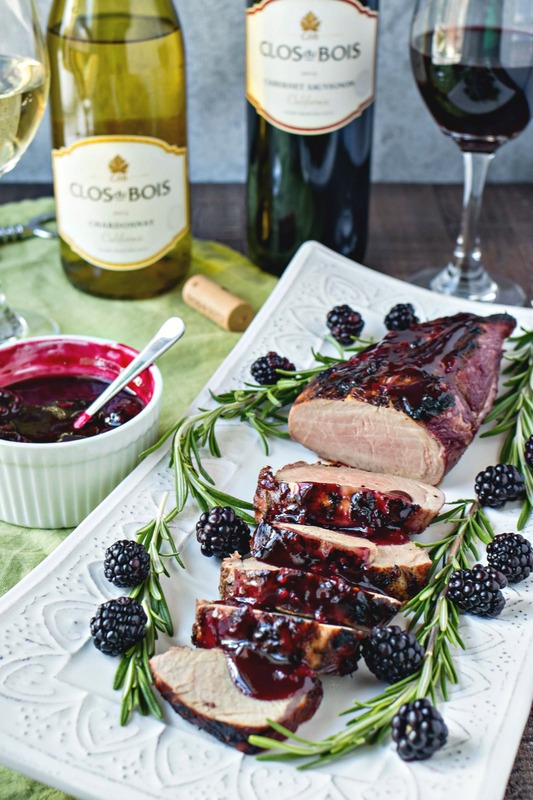 Such a great idea to add blackberries to this beautiful pork tenderloin, I’ll bet the flavors are spectacular! I’m a fan of Clos du Bois wines, especially the Chardonnay on a warm summer evening. I love that you added berries to this gorgeous tenderloin! I’ve been adding them to everything this summer, and it’s awesome 🙂 I’ve always loved Clos du Bois wines, so this meal makes me happy! This sounds so good I can almost smell it. I love your thorough recipe and photos. This is a killer dish! It’s a great combo of fruity, fatty and savory. Look forward to making this for a holiday. We’re having pork for dinner tonight and you’re making me wish we had blackberries. Yum! Looks delicious, and beautiful presentation! Looks so delicious and fancy! My hubby would love this! Thank you! Mine sure did! I love pork loin. It’s one of my favorites and I will definitely have to try it this way because this looks absolutely amazing! I absolutely love making fruity glazes for pork. I’m definitely going to be giving your recipe a try! Yesss! You’re gonna love it!